Thank you to @dlnt on Twitter, it now seems DCA released a new map on Sunday 04/22 featuring a very odd choice – the backside of the Pixar Pal-a-Round wheel. I get wanting to get the sign in the picture, but couldn’t they use photoshop to flip the wheel around and show the Mickey side on the map. Why show the ugly backside? Disneyland stayed the same with the Mickey’s Mix Magic cover. Now this brings up more questions. How long are these out for? Are they out to 5/1 which are the dates of the new maps I posted yesterday? I’m hearing Philarmagic may open Friday which is 04/26. Could these maps be out for only a couple days? If anyone knows more info, please share. I will post more as I hear. Happy Collecting! DLR updated their website with new maps but are these maps going to come out tomorrow or May 1st? Disneyland has the new Mickey Parade float on the cover while DCA has Mickey’s PhilharMagic image on the cover and also has it listed as an attraction on the inside. It was announced that the PhilharMagic show will be coming to DCA in April but I have yet to hear an official announcement of it opening. Also, it’s odd that the codes are 050119-ENG. Lately, the code has actually lined up with the date the map came out. There is a filler map that is coming out tomorrow and they don’t want to bother to upload the filler map to the website for only a week so they just went ahead and uploaded these maps. I plan to head to the parks on Saturday so I will know for sure then if I don’t hear anything prior. These maps should be around until Star Wars opens at the end of May. Just curious, has anyone been to the parks lately. It was quietly announced that Jessie’s Critter Carousel opened over the weekend so did they update the map to reflect that? The March DCA map had the attraction listed but has “Coming Soon” written where the description should be. If you see a new map, please let me know. Since the Food & Wine Festival at DCA kicks off today, we got some new maps! Other than the recycled Lunar New Year Map, I’m really loving the covers this year. They’re all original and all fun. Disneyland features the Mickey Mix Magic Show and the DCA features a family enjoying the Food & Wine Festival. I’m assuming these will be around until April 23rd when the Festival ends. Happy Collecting! Now that the Lunar New Year celebration ended yesterday, we got some new maps today and I’m happy to see some new original covers. Disneyland features the original lead float from the Soundsational Parade and DCA features a daytime shot of Guardians of the Galaxy. These maps should only be out for the next two weeks as we should receive at least a new DCA map reflecting the “Food & Wine Festival” on March 1st. Here are the scans for the new maps that came out on January 25th. January 25th – February 17th – Both Parks update maps to reflect Get Your Ears On official kickoff at Disneyland and the Lunar New Years’ Event at DCA (Lunar New Year ends Feb 17th). 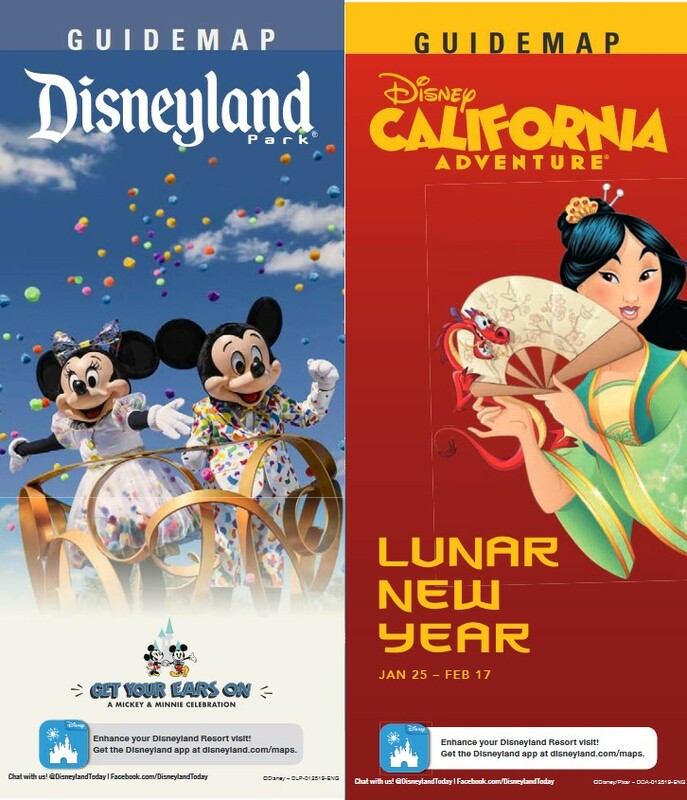 New maps are out today reflecting the “Get Your Ears On” celebration on the Disneyland map along with “Lunar New Year” on DCA’s map. I love the Disneyland cover even though I read online it’s a picture from the WDW parade. The DCA map is sadly the same exact cover from last year. I was hoping for something new. I’ll upload the inside scans once I receive them. These maps should be around until February 18th which is the day after the Lunar New Year celebration ends. Thank you to @touringplans on Twitter for the pictures.